Fiat Chrysler Automobiles NV, also known as FCA, is an Italian-controlled multinational corporation incorporated in Italy and currently the world’s seventh-largest auto maker. The group was established in late 2014 by merging Fiat S.p.A. into a new holding company, Fiat Chrysler Automobiles N.V., which is incorporated in the Netherlands (with headquarters in London) for tax purposes. Fiat has launched a new entry-level petrol variant in the Punto EVO line-up. Called the Punto EVO Pure, this variant has been introduced at a price of Rs. 4.92 lakh (ex showroom, Delhi) and is a replacement of the Punto Pure. 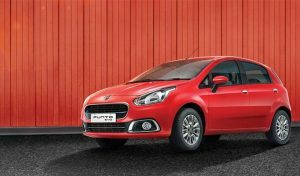 It is currently the most affordable offering from the Italian car maker in India and it will be available only in one variant and comes in only one engine option – 1.2-litre petrol. The Fiat Punto Evo Pure features 1.2-litre FIRE petrol engine that delivers a maximum power of 67 bhp at 6000 rpm and develops a peak torque of 96 Nm at 2500 rpm. Transmission duties are handled by a five-speed manual gearbox as standard. Other features include a hydraulic power steering along with a well-tuned suspension, which Fiat says makes the car capable of handling the bumpy roads while not sacrificing on comfort. In terms of looks, there are no changes made to the car’s exterior or its cabin. Up front, the Punto Evo Pure comes with Fiat’s signature ‘Reindeer’ headlamps with black plastic cladding on the grille along with a wide air-dam and large fog-lamp enclosure with chrome surround on each side. The Punto Evo Pure gets steel wheels with full wheel caps, black ORVMs and door handle. The cabin comes with black interiors and fabric seat covers. The car’s instrumentation include Digital Clock, Digital Odometer, Digital Trip meter, Distance to Empty Indicator, to name a few. With the Fiat Punto Evo Pure, the company is also offering 3 year warranty with service intervals of 15000 km to its customers.